Juiliana Swatko works with alternative photographic processes challenging and redefining the limits of the photographic image. Exploring antiquated and unconventional techniques, including cyanotype printing, hand coloured and electrostatic imaging, thermal printing and, more recently, lomographic photography combined with digitally manipulated superimposition, she produces complex images that relinquish the premise of straight representation. Employing plants and other natural elements as its primary subject matter, a lot of her photographic work treads the line between abstraction and figuration, producing unrecognizable forms from commonplace plant life. However, her photographs of people are equally compelling for the way they distort and refigure the body. Working with such experimental methods allowed Swatko to introduce an element of chance within her work. By rigorously testing these initially unpredictable processes, Swatko was able to create parameters to control the outcome of each image. Yet even so, the formal features of each work remain dependent on the particular technology used. With their smooth matte texture, the Haloid Xerox prints look like charcoal drawings. 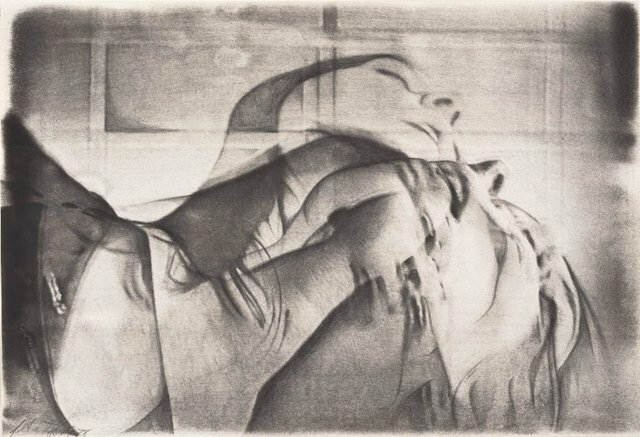 In the tangle of superimposed forms, built up through multiple exposures, traces of movement emerge from the image. Some of these forms are barely comprehensible. In ‘Angel’, the faint outline of a pair of wings protrudes from the figure. Amidst the chaos of lines and form, these wings look as if they are about to take flight. The figure in ‘Imbedded child’ also moves and dances within the frame of the still image. Fragmented and duplicated, this body redefines its physicality. The imbedded child, a mirror image of the subject herself, becomes visible as the corporeal form becomes semi-abstract. Signed and dated l.l., pencil "J Swatko 1978".